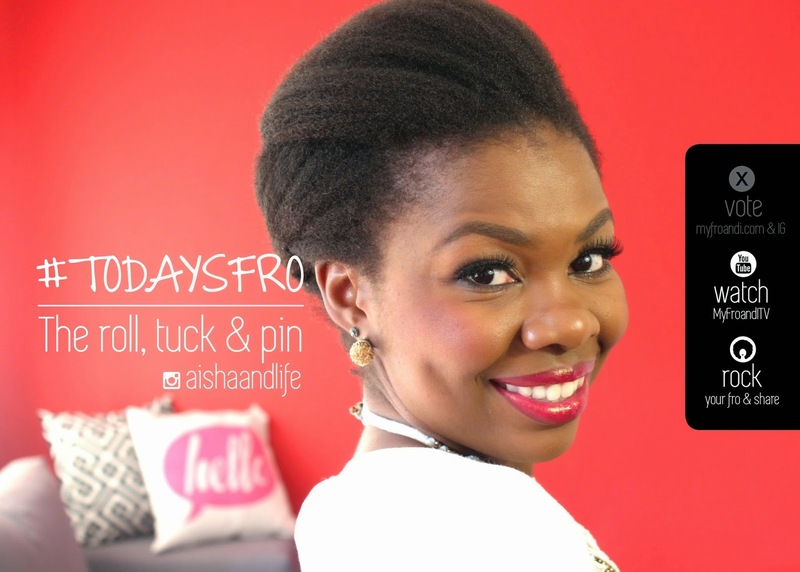 The first #todaysfro tutorial is live on MyFroandITV! Voted by you, styled by me, the roll tuck and pin style I do in this video is a great way to style your natural hair for the office, a date or any other special occasion. It’s quick, simple and doesn’t take the super gifted to achieve. I’m really excited about these new set of video tutorials as it marks my new set up and overall look to my videos which I’m really looking forward to sharing with you. Next Post Because I ♥ Your Fro Too! Hi Aisha!!! I am Tanzanian lady living in Dar es Salaam. I am in my 30's. Although i'm a bit older …. I loooove your hair and styles!! !… It is sooo real and beautiful. You have really convinced me to transition to natural. I have long damaged relaxed hair.For two years i have been trying to create a regimen that will improve its health and failed. My last relaxer was in November 2014 and i will never do it again. One of my 2015 Resolutions is to go natural without a Big chop. I will do a lot of (cornrows) without extensions because i want to protect my hairline and edges. This blog, will guide me to my dream. Thank you so much lil sis, keep on inspiring african women to embrace their natural awesome beauty…..Natural hair!!!! Good job!!! Asante for your comment dada. It means a lot to know I have support and fans from home and I'm humbled to know my experience inspires you.